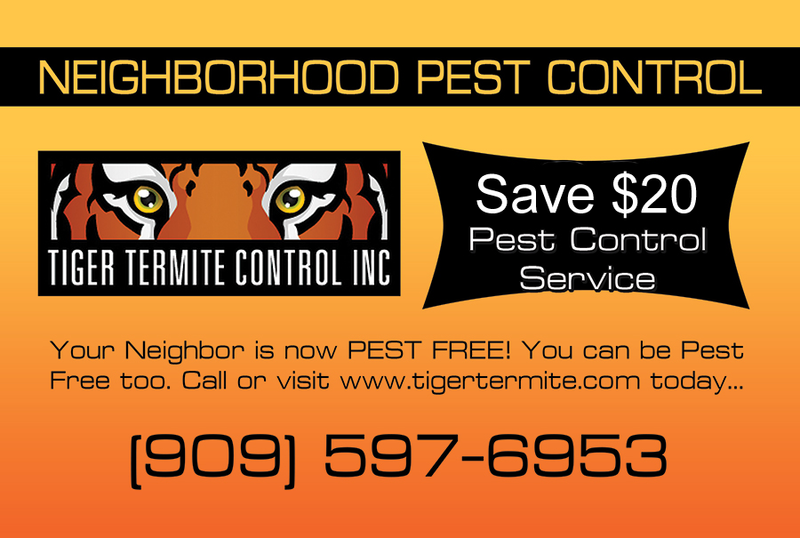 Tiger Termite offers Quality Pest Control Services featuring reduced-risk pesticide products for the control of Ants, Spiders, Roaches, Fleas, Crickets, Wasps and other problem pests. Whether you need a one time service or would like the convenience of regularly scheduled visits, you can count on us to design a personalized program for your individual needs. Call (909) 597-6953 for a free evaluation and consultation. Outside Service Includes: Liquids, Baits and Dusts. Exterior treatments may include treating the entire perimeter of your foundation and around your eaves, outside entrance doorways, porches, patios, garages, window casings, door frames, cracks and crevices, treatable plants, or even entire grounds maybe sprayed to kill and repel ants, spiders, and other crawling insects. We remove spiders, spider webs, wasps and wasp nests. We also treat mosquito harborage areas, wood piles, etc.. as part of your regular service. Inside Service Includes: Liquids, Baits and Dusts. Interior treatments may include treating baseboards, switch plates, corners, storage areas, closets, around water pipes, doors, and windows, attics, behind and under refrigerators, dishwashers, cabinets, sinks, furnaces, stoves, the underside of shelves, drawers and similar areas. We may also dust all plumbing entrances in kitchens, bathrooms, wet bars and treat all kitchen & bathroom cabinets. Inspection of closets, attics & water heater areas may also be performed. The service includes treating areas where insects are likely to live or gain access to your home. The initial treatment includes treating the interior and exterior of the home. Subsequent treatments are generally exterior only unless requested by the homeowner. Your home is always guaranteed between regular visits. Call today for a free estimate (909) 597-6953 or click here Inspection Request and send an email.